In nearly every talk given by historian Joseph J. Ellis, he is asked about what the Founding Fathers would think about their own views and how they resonate in contemporary America. Here is his widely anticipated answer. Ellis examines four key historical figures through the prism of particular topics: Thomas Jefferson and the issue of racism; John Adams and the specter of economic inequality; George Washington and American imperialism; and James Madison and the doctrine of original intent. Using the perspective of the present, he reveals how their now centuries-old ideas illuminate the disturbing impasse of today's political conflicts. 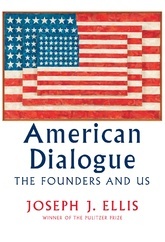 American Dialogue is a provocative and compelling exploration of our most fundamental ideals in action.